There will be NO Walk Ins onsite accepted for this event, no siblings or younger Scouts are able to attend–only paid pre-registered attendees ar able to be at the Webelos Jamboree. The Webelos Jamboree is an opportunity for ALL Webelos to camp at a fun competitive outdoor event geared to only the Webelos as they transistion through their advancement to be better prepared to enter a Troop in the Boy Scouts. The weekend will feature advancements, games, competitions and activities designed for Webelos Scouts. Why cant siblings or younger children come to this event? Webelos and AOL is the “Transistional Program” in the BSA that takes our Scouts from Cub Scouts to Boy Scouts. In their new troops they will rely on their Scoutmaster, Adult Leaders and older boys in their Troop for guidance and leadership. This can be a big change from Cub Scouts, which is fully family oriented -where they rely only on their parents and Pack Leadership as they progress. This is a great opportunity to assist them in becoming more mature and independent and best prepared to enter a Troop. This is our Council’s one event where the Webelos are the “Main Event”. It is all about them-they do not have their younger siblings present- whom can as we know sometimes be a distraction from the experience. Siblings may remain at home and are welcome to attend in the future when they become Webelos Scouts- and it is their time to shine. The AWESOME theme for the 2019 Webelos Jamboree is: You will find out soon! When? Starting from 6 pm Friday November 1st, 2019 to Sunday November 3rd, 2019 at 11 am. Where? 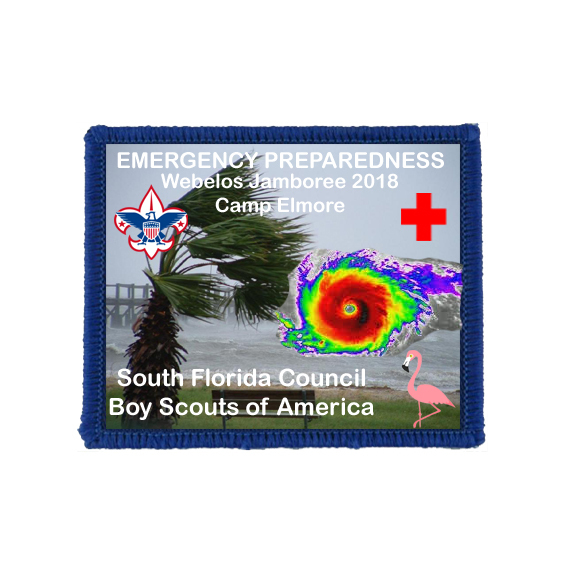 Camp Elmore (Broward) 3551 SW 142 Avenue, Davie, FL 33330. Supervision? A den leader, parent or guardian must be responsible for each Webelos Scout for the entire event. Adults should not supervise more than three Webelos. Parents may allow another parent or leader to supervise their Webelos Scout at this event. Registration? Early Bird Registration ends on October 20, 2019. All Regular Online Registration ends Sunday, November 3, 2019. It is extended for you! There will be NO Registrations accepted after November 3, 2018. Only Online registration is available. There will be NO Walk Ins accepted onsite. Register early and ontime to be included. Siblings may not attend, they may not tag along for the day or camp at this Webelos ONLY program. Please let them stay at home for this weekend with another adult or guardian. They may register as Webelos to attend when they are older. $15 Two Night Camping Early Bird (including adults and Webelos) if received by Oct 20, 2019. $10 Day & Visitor Early Bird (including adults and Webelos) if received by Oct 20, 2019. $15 Day Visitor (including adults and Webelos) if received by Nov 03, 2019. No registrations will be accepted after November 03, 2019.
send to–Ayesha Carter at 305-364-0020 or 954-584-4200 at ext. 232. Food? Units should be prepared to provide all their own meals. Crackerbarrel will be on Friday and Saturday evenings for unit adult leaders. Weather? This is a “rain or shine” event. Insurance? Liability as well as Sickness and Accident Insurance is provided for all registered members and leaders of the South Florida Council. Ayesha Carter at 305-364-0020 or 954-584-4200 at ext. 232. Online Registration will be opened on August 1st for the 2019 Webelos Jamboree and will close on November 3rd. Only PAID REGISTRATIONS by November 3rd will guarantee you a patch, we have tried to help you to register timely. Walk Ins WILL not be available. Siblings may not attend or be at this Webelos ONLY event. They may return later when they become a Webelos.